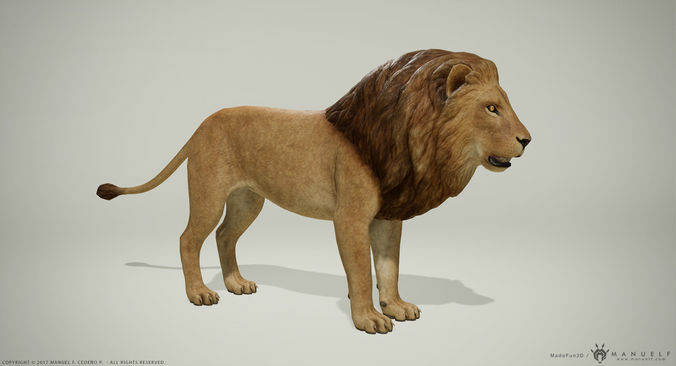 Game-ready model of lion and lioness with PBR textures. Ideal for Virtual reality applications or games. Eyes, tongue, claws, tail puff, and mane are separate meshes from the body. The body of the lion and lioness are exactly the same mesh, the only difference is in the textures. All textures available as JPGs and Targa files. DirectX Normal map. Overlapped UVs. The images of the textured model are screen captures from Unreal Engine 4. The wireframe images are screen captures of Substance Painter.